This is an elite collections of important and intelligent quotations in English through the centuries. 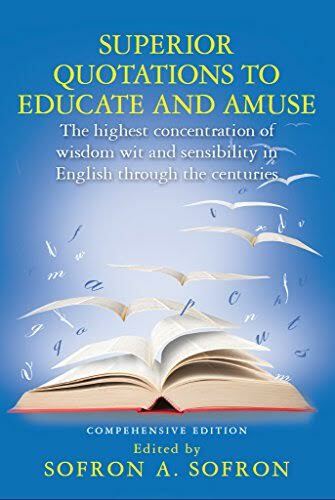 It can be confi dently described as representing the highest concentration of wisdom, wit & sensibility ever written or spoken in the English language or tradition, ranging from the Venerable Bede and Chaucer to Mark Twain, Einstein and Feynman. It abounds in sparkling and memorable thoughts and expressions from Great Britain, the United States, and the Commonwealth as well as from various other Englishspeaking countries and peoples. The quotations have been thoughtfully selected for their instructive and entertainment value and as vehicles toward an all-round higher education and culture in both the sciences and the humanities. Quotations from a number of fields, encompassing history, politics, literature, economics and the physical and life sciences are included. This book will allow the reader to consort with, and listen to the 'voices' of, some of the most intelligent, amusing, well-spoken and even out-spoken people of the past and the present.